Trailer lights are an integral part of towing. Not only do they provide a necessary element of safety on the road, but they are also required by law. Compared to the rigid design of a trailer hitch, however, trailer tail lights and brake lights can be fragile and broken if accidentally bumped with enough force. CURT offers both trailer lighting kits and combination trailer lights to get you back on the road sooner. CURT trailer light kits come with everything you need to rewire your trailer and have it ready to hitch up to your vehicle. 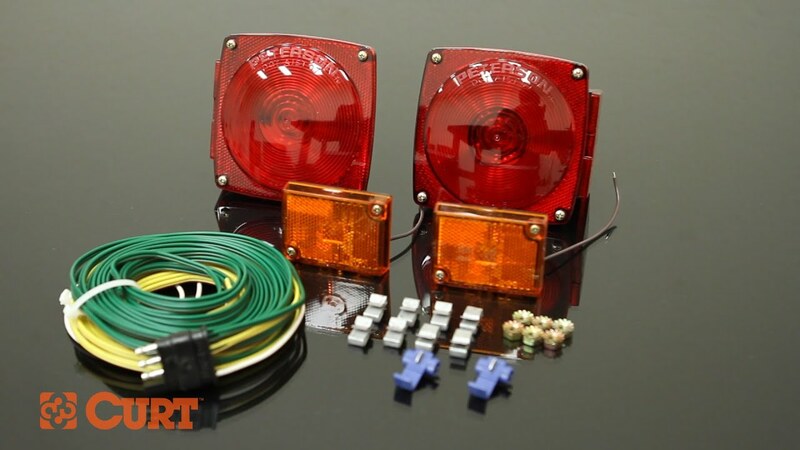 These kits include combination lights, marker lights, a wiring harness and frame mounting clips to easily route wiring through your trailer to the coupler. CURT trailer lighting kits are designed to work with trailers up to 80” wide. Whether you are building your own trailer or rewiring an older trailer, these kits make the process simple. With each kit, we include easy-to-follow instructions, and provide an online video that shows the complete process of how to rewire a trailer. Use a CURT trailer light kit for your boat trailer, motorcycle trailer, snowmobile trailer, livestock trailer, utility trailer or even for your camper. If your trailer wiring is still in good condition and you simply need a replacement lamp, CURT has combination lights in several different shapes and sizes. Choose from the submersible option or the surface-mounted style. CURT combination lights are made with quality molded housing and feature lenses with phosphor bronze contact for a consistent connection. Hooking up a new combination light is quick and simple, and with CURT, you can trust that your new electrical component is built with quality and care.